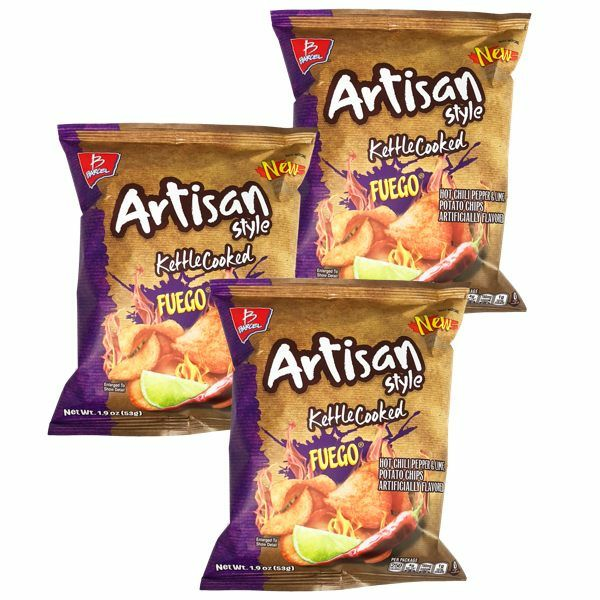 Barcel's Fuego Chips by Papas Toreadas by Barcel are delicious kettle cooked textured potato chips. Handed down from generation to generation, Chiles Toreados are created by intensifying their heat, with the scorching of fresh chiles on a blistering grill. Barcel has captured the chiles toreados essence with a new, thin-cut, fiery (fuego) flavor, crispiness and crunch with a hot heat that is not overwhelming and grows hotter after eating just one chip. Excite your taste buds with Toreadas, a new tradition from Barcel. Try them now!. Ingredients: Potatoes, Palm Oil, Seasoning (Iodized Salt, Citric Acid, Maltodextrin, Sugar, Monosodium Glutamate, Artificial Flavor, Vegetable Protein Hydrolyzed, Artificial Colors, Onion, Partially Hydrogenated Soybean Oil, Sodium Bicarbonate, Chilli Pepper Extractives, Sodium Inosinate and Sodium Guanylate, Sodium Diacetate and Less Than 2% of Silicon Dioxide (As Anticaking Agent). Contains 2% or less of the following antioxidants (TBHQ and/or BHA and BHT). Barcel's Papas Toreadas son unas deliciosas papas con sabor a chile.Pasado de generaci�n en generaci�n los Chiles Toreados obtienen su sabor al serasados en brasas calientes para intensificar su delicioso sabor ardiente.Barcel a capturado su esencia con un nuevo y ardiente sabor a chile, cortesfinos, frescura y muy crujientes. Tori-antojate con delicioso picante ycrujiente sabor!! Modo de Uso:Disfrutalas asi solas de la bolsa, con un sandwich, una hamburguesa,hot dog, etc. Disfrutalas como botana viendo una pelicula o tu programa detelevision favorito!